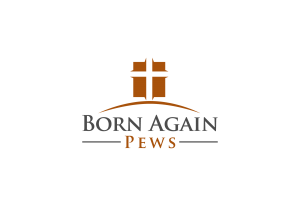 Reverend Gary Watts of the Jacksonville Congregational Holiness Church in Jacksonville Alabama joined us when we finished installing new church pews to admire our good work. 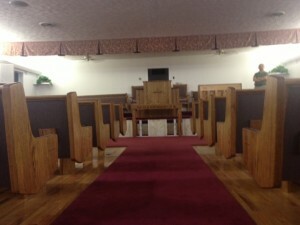 We love the floating pew design with the carpet runner that gives the church a modern and airy feel. These custom new church pews are made of solid oak and other high quality materials, just as all of our pews. Jacksonville, Alabama is home to Jacksonville State University. Originally named Drayton, the town was renamed after President Andrew Jackson in 1834 and the University was established shortly thereafter in 1883. Home to the Gamecocks, Jacksonville is famous for it’s marching band, the Marching Southerners. 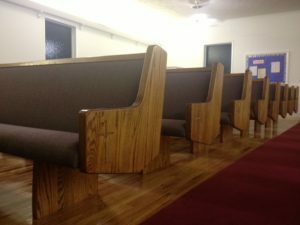 If you’re looking for church pews for your church with hardwood floors, this installation in Jacksonville is a good example of how well done church pews can look with hardwood floors. Because hardwood floors are made with quality woods, you’ll want to use quality woods for your church pews. 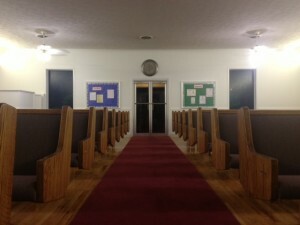 If you don’t, it will look glaringly obvious that the church pews are veneers while the flooring is much better quality. 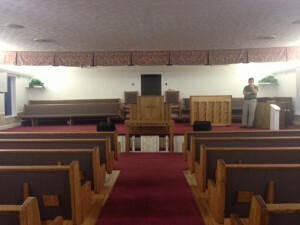 As you can see in these photos, the solid wood church pews match in color to the wood flooring. Solid wood makes this possible. Wood allows you to give a beautiful look to your church and match it very closely to ensure your church has a cohesive look. We love this runner of carpet that gives a visual center to the church which makes it an ideal path for church goers to focus on during different parts of the church service and for events like weddings. If your church has weddings booked regularly, choosing a carpet and wood flooring scheme like this will give a visual cue for weddings as well as keeping your floor in great condition.